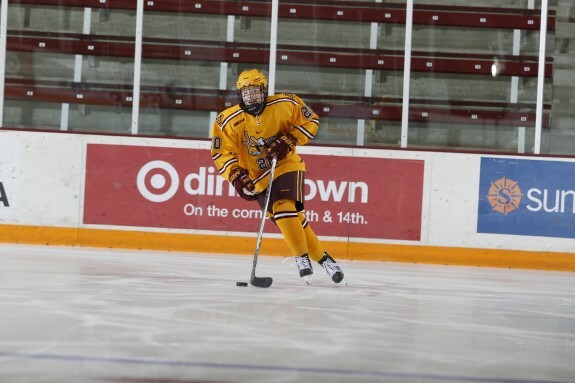 MINNEAPOLIS – The Univeristy of Minnesota Golden Gophers swept their opening weekend series against the Lindenwood Lions, capping things off with a 6-2 win Saturday. Despite a deep roster, particularly at forward, the Gophers are dealing with transition early in the season. Last season’s departures included two of the best forwards in school history and their starting goaltender. That leaves some big questions to be answered in their quest for a third straight national championship. Can their freshman contribute offensively to help provide depth and depth chart stability after the loss of Hannah Brandt and Amanda Kessel? And will junior goaltender Sidney Peters be able to thrive in her new role? Freshmen Lindsay Agnew, Alex Woken and Patti Marshall, as well as redshirt sophomore Nicole Schammel, played their first regular season games in maroon and gold. It was an opportunity for the young players to get their feet wet against a Lindenwood team that was simply outmatched. And it was worse than the scoreboard suggests. Saturday, Lindenwood’s 26 shot attempts paled in comparison to the 73 the Gophers lobbed at goaltender Morgan Skinner. In fact, it was even worse than the shot attempts look. Only three of Lindenwood’s shot attempts came from the home plate area, while the Gophers had 13 in the first period alone. However, in an imperfect world, there are imperfect results. Lindenwood hung with the Gophers through two periods, entering the locker room with just a 3-2 deficit. In the third, Woken grabbed her first career goal as a Gopher with a blistering shot from the dot. “It’s pretty exciting to just get one under your belt and get the nerves out,” Woken said. Marshall played sound defense and ate up major minutes with only five defensemen dressed. Schammel also looked good at times and exhibited some chemistry on the second line with Cara Piazza and Kate Schipper. Woken’s play earned her first star of the game honors, while Agnew was named the third star of the game. It was an auspicious start for the freshmen. At the other end of the rink, though she posted a shutout Friday, goaltender Sidney Peters struggled Saturday. While the Gophers dominated, that’s not always the easiest situation for a goaltender. There wasn’t a single period where the Lions registered a shot on Peters in the first five minutes of the frame. It’s not something Peters has had to deal with much, seeing limited ice time behind Leveille over the last three seasons. That’s likely to change in a hurry for Peters and her ability to adapt will be a key to success for the Gophers. In the end, Peters allowed two goals on seven shots while playing just a shade under 50 minutes. Coach Frost put freshman Serena D’Angelo in net for the final 10 minutes giving her some game action when the win was all but assured. The goals Peters allowed came off the rush and she was a difficult situation playing back-to-back games and seeing so few shots. But, as coach Frost said, that situation is not likely to change. She’s the starter and the Gophers are capable of shutting things down for opponents. That can mean long stretches where a goaltender doesn’t see a shot. However, Peters should start seeing more shots almost immediately. The Gophers start conference play with a series against Bemidji this weekend, followed by a series against Duluth, who surprised many and went 1-0-1 against Boston College. The road doesn’t get easier but based on their play so far the problems the Gophers need to solve are a matter of tightening screws. At this point in the season, many teams are still looking at the instruction manual.